Holdren captured an event title in six straight seasons from 1998-2003 on four different tours. His most recent win came in his hometown of Santa Barbara in 2005, playing with Jeff Nygaard against Todd Rogers. Other favorite highlights are 2001 <?xml:namespace prefix = st1 ns = "urn:schemas-microsoft-com:office:smarttags" />Hermosa Beach title and 2002 Manhattan Beach title. He has eight wins with former high school teammate Todd Rogers and five with Eric Fonoimoana. Holdren qualified for the 2004 Olympics in Athens, Greece with Stein Metzger, taking fifth place. In his pro beach career, four of his seven partners have been beach volleyball Olympians. In 2007, Holdren cracked the top 20 in career domestic earnings. In international competition with Rogers, the duo won a World Tour title in Mexico in 2000, where they defeated Kevin Wong and Rob Heidger in the finals after advancing through the qualifier and playing as the 32nd seed. 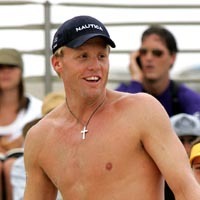 In 1997 was the AVP Rookie of the Year after finishing second in the U.S. Championships. In 2005 he finished ranked second on the Tour in digs (909), and ninth in both kills (1,108) and aces (48). He ranked seventh in digs on the 2006 Tour (4.34 per game) and sixth in 2007 (4.77 per game). Holdren has one sister, and is a 1990 graduate of Santa Barbara's San Marcos High School, where he played two years of volleyball. He attended Santa Barbara City College, where he played for one season. Helps with youth volleyball and basketball leagues for children in Santa Barbara. He and his wife Jen, a pro beach volleyball player, have two children, Kobe and Ellis, and a dog (Storm).